I tried this fix in saluki and in lighthouse on 2 machines. It does not solve the menu highlighting problem. The puppy that grub4dos does not find is Legacy os4. They caused the application to freeze when clicked. The app does work well otherwise. Thank you don for the report. I am aware that the '<list>' box of the gtkdialog is buggy under some circumstance. It will be replaced with '<tree>' by coming release. Hopefully it will fix the problem. I am using a splash screen with saluki 21. But the fix did not fix it. The Legacy 4.21 sfs is in the mnt/home/Legacy os4 folder. means 'Legacy os4' with a space? Can you save your session there? Ensure BOTH from the menu.lst and menu-advanced.lst commented out the 'color' line if you use the splash image. OH Ok I found what you were talking about for the Advanced Menu.lst. Yes that fixes that problem. Thanks for your persistence in helping me SEE it. Posted: Thu 03 May 2012, 15:46 Post subject: Legacy os and others that the grub4dos can't see. Yes, the space makes a difference. after the name that I did not know was there. 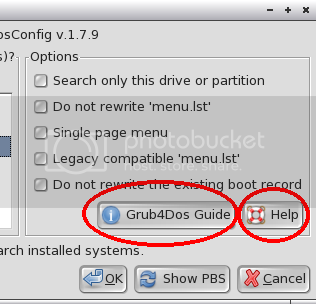 When I deleted it, Grub4dos could see the installation. When I tried to boot Hansamben, Grub4dos did it with no problem. So I changed Legacy os4 to Legacyos4,and then Grub4dos could see the installation. With Lighthouse x64 5.14 Grub4dos finds the main sfs file but can not load it into ram. So boot fails. Still I love this program. I made a full install. When I tested more recent Puppies they worked well. Here's how to duplicate the bug just for the record. 2) My browser wasn't set and I have no internet access. I installed your pet package. two icons I showed in picture. I checked a full install of LUPU 528 and it did the same thing. Note that version 1.7 doesn't have this problem. I couldn't reproduce with lupu-528.005 furugal install, pfix=ram. Depends on the hardware? But i have encountered similar problem with other program using <list> in the gtkdialog3 on lupu-528JP(developing). Anyway, I will switch to <tree> instead of <list> in the next release. The <tree> is used in the Puppy Package Manager, so it must be stable on many Puppies. Posted: Thu 03 May 2012, 21:56 Post subject: Re: Legacy os and others that the grub4dos can't see. Have you ever run the Legacy and/or Lighthouse x6 on your PC? The kernel the Puppies use and your hardware may cause a problem.